Discussion in 'Computers & Technology' started by Mike B., Mar 6, 2008. Thinking of going the voip route, most likely with Vonage. Currently have a Netgear wireless-g router that has served me well. Any thoughts on the best way to set this up? Will have two PCs, Xbox and the laptop hooked up. Vonage has a few devices you can select from. The easiest one is the simple phone adapter. Phone plugs into adapter, adapter plugs into router. I have a Linksys router w/ VoIP phone ports from them. I assigned it to a different subnet from my regular network (the VoIP box is on 192.168.2.x, the regular network is on 192.168.1.x), turned off all the router functions and plugged the WAN port of the VoIP router into my main router. It's fairly simple. If you have an open ethernet port on the Netgear router, plug the vonage adapter into it. More info is needed on your setup is needed if it's some funky setup you have going. Nothing fancy for the setup. So just keep the current router and basically turn off all routing functionality - basically making it a wireless switch. I can swing that. No, I mean I turn off all the routing functionality on the Vonage router that you'll get and make that essentially just a phone adapter. It's all easier if you just get a phone adapter from them instead of a router. IT IS REALLY, REALLY HARD TO SET UP!! 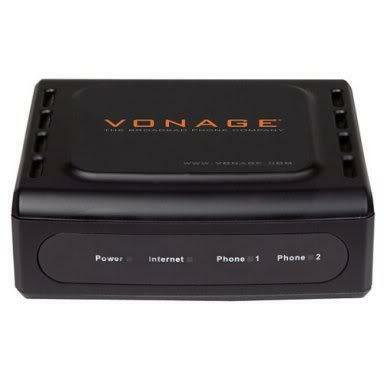 I got a router/adapter from Vonage. I plugged in the power cable. I plugged in the phone. and that's with linux! Can you imagine how easy it would have been if you used a Mac? The digital display on top of that adapter will just confuse you. Hit up target and pick this up for $50. Plug it in and call Canada all you want. No configuration, no excess plugs, it's just a tiny box you plug into your existing router. That was with Windows. 2 years ago.